I've been knitting for as long as I can remember. Even as a pre-schooler I remember having needles and yarn in my hands. Yes, I'm obsessed and make no apologies. 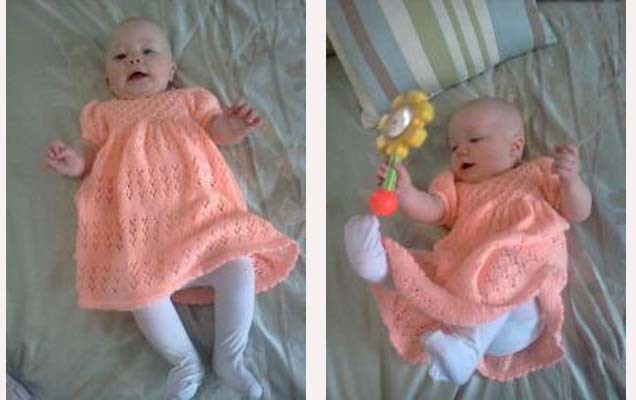 A couple of days ago my daughter snapped a couple of photos on her phone of my granddaughter wearing a knitted peach-colored dress. This is a dress that I made for Jessica more than 30 years ago and now Makayla (6-1/2 months) is wearing it. I remember the dress but I didn't know that it was still around after all this time so you can just imagine how heartwarming it was to know that it was being worn again. I don't remember what yarn or pattern I followed. If I was to guess I'd say it was probably a pattern and baby yarn from Patons. It was the most common yarn available at that time and place. By the way, the rattle that Makayla is playing with was her Mom's too. Sweet! I remember making that dress for my daughter 30+ years ago too. :) It was a Patons pattern and yarn. I still have the pattern booklet after all these years but I think the dress got handed down to my niece.